No matter how many times the alarm sounds during your shift, these black flame-resisting leather upper KnockDown boots go on with ease. Once your foot slides in, the ankle lock system holds you firmly in place until you use the handy heel kick plate to take them off. Our exclusive Vibram® Fire & Ice All-Terrain Sole provides exceptional traction on any surface; including pitched roofs and steep embankments. It stands up to the heat and will help keep a steady foot when fighting winter fires and the water turns to ice. The PTFE Moisture Barrier also repels dangerous fluids. Take a hit to the heel thanks to the Poron® XRD® padding - the same impact protection used in motocross racing. Composite Safety Toe, Lenzi L-Protection® insole, and steel triple-rib ladder shank protect your foot from impact and the strain of working on ladders. And because you might be on your feet for hours, the dual-density removable insole molds to the shape of your foot to keep you comfortable until you’re back at the station. 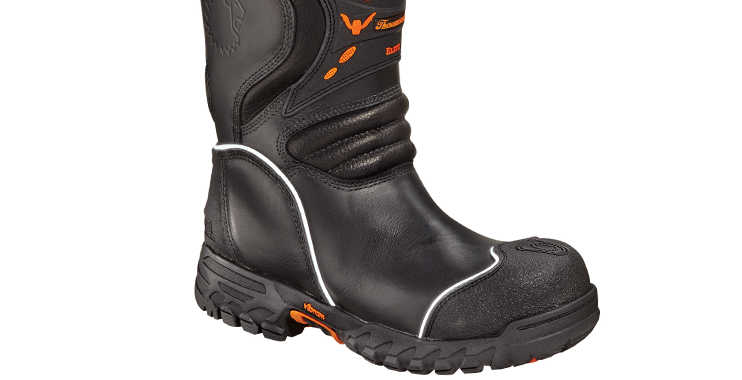 • Waterproof, flame-resisting leather upper with abrasion-resisting rubber toe and heel protection.